Heat coals or gas grill for direct heat. Thread chicken, onions and bell pepper alternately on each of four 10-inch metal skewers, leaving space between each piece. Reserve 1/2 cup of the dressing for serving. 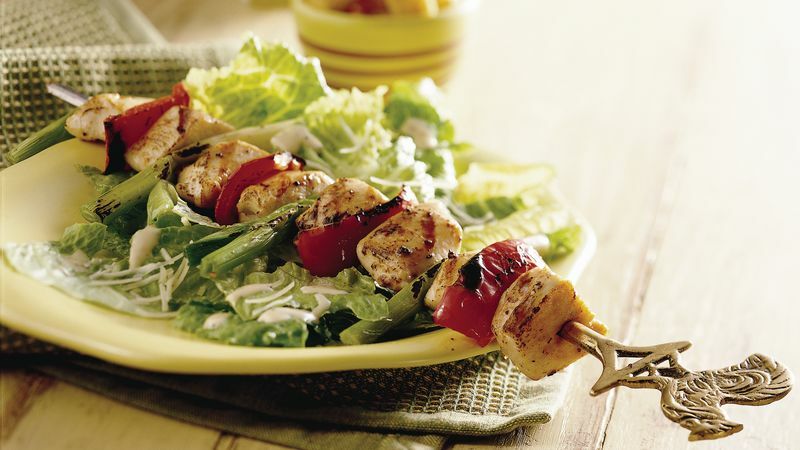 Brush skewers with remaining 1/4 cup dressing. Cover and grill kabobs 4 to 6 inches from medium heat 10 to 12 minutes or until chicken is no longer pink in center. Arrange kabobs on romaine; top with croutons and cheese. Serve with reserved 1/2 cup dressing. One bag of complete Caesar salad mix can be used instead of the romaine, dressing, croutons and cheese. Either omit brushing the dressing on the chicken and just use dressing for salad or use additional Caesar dressing. We also recommend adding extra Parmesan cheese.